In the zero-sum game that is the NFL playoff system, there are 12 winners and 20 losers–no exceptions. And, if you ask the people from New England or San Diego, they will probably both tell you that it is not always the best 12 teams that “win” or the worst 20 teams that “lose.” But, whatever it is, it is clear that 12 sets of fans have hope that this “new life” that their teams have found will leave the past 17 weeks’ worth of disappointments and frustrations (more for some teams than others) behind them and it will all come together as chapters in a book with a glorious ending. Like the Texans, this team’s fans were spared some heartache by the team’s heart and success down the stretch. In fact, if you only saw the last 5 weeks of the season, you would be shocked to find out that the 49ers were not the absolute class of the NFC West. Plus, it seems they found a coach…now all they need is a quarterback. Some people call the NFC South the best division in football, so the heartache of last place is not as severe for fans of the Saints. And, if you’re a fan and you’re team is offering you up heartache after heartache, you get really good at finding silver linings and strong, relieving rationalizations. The silver lining is named Drew Brees, who had one of the best seasons at quarterback ever (and led an entertaining offense week in and week out), and the rationalization is that the Saints were murdered by the schedule-makers–they went 5 weeks without a home game and were still a couple plays away from 9 wins. Though this team had pretty high expectations and fell WAY short of them, there are still some rationalizations that can be made–like injuries–to justify why this team can rise again to the top of a very bad division. Yes, it’s probably disappointing to see Holmgren go out like that, but it’s time. If I told you that there were 15 fan bases that were kicked in the groin harder than the Raiders fans were this year, you would call me nuts…until I listed off the next 15 teams. The Raiders actually finished relatively strongly this year, including wins in their last two games against Houston and Tampa Bay. No, I do not think this is a sign of things to come. I think the Raiders are terrible and will remain terrible, I just do not think that their fans have as much to complain about as 15 other teams’ fans. Another really bad team, but not surprisingly and, therefore, not that heart-wrenching. Everyone knew the Chiefs would be bad. The problem with this team–and the reason that they are after the Raiders–if because they lost so many games in such dramatic fashion. Just look at the two games against AFC West champion San Diego, where they had a 2-point conversion fall short that would have won it in the first game and then the Chargers needed a touchdown-onside kick-touchdown flurry to win the second. This might be one of the best 2-14 teams ever…yes, I just said that. And the hits just keep coming. This is another team where if I just told you where they were in this ranking, you would call me crazy…until you heard the other 13 teams and compared their seasons to the Bengals. Has one tackle every really changed a franchise as much as the hit that Kimo von Oelhoffen put on Carson Palmer in the 2006 playoff game? How excited were you, as a Cincinnati Bengal fan, back then when your team won the AFC North, with an 11-5 record and the whole core of the team was young and full of potential? Since that tackle, they have not had a winning season, let alone a return to the playoffs, culminating in this year’s 4-11-1 season. It feels like the Rams played 2-14 seasons with an 8-8 in the middle of it. They were the NFL’s worst team, then they actually looked semi-decent (with wins over Dallas and Washington–we’ll get to that), and then they returned to awfulness. And, the worst part about it for the fans is that there is still some talent on this team. Not pretty to be a Rams fan this year. At least the Browns have a semi-decent quarterback (Brady Quinn) and some skilled players. And, at least there is a glimmer of hope with the firing of Romeo Crenel. Plus, they lost three quarterbacks to injury this year–THREE. So, it’s not all bad in Cleveland. Then again, this team was 10-6 last year, and they may never have been as far from being a playoff team as they are right now. In fact, other than the Detroit Lions, I don’t think there is a team in the NFL that would surprise me more to make next year’s playoffs than the Browns. They did not score an offensive touchdown in their last SIX games (an NFL record), including shutouts in the last 2. Coming off a 10-6 season, that is depressing. Thanks to the collapse of the Denver Broncos, the Jaguars have officially stolen the title of “most disappointing season” from the Chargers (even though, in reality, the Chargers lackluster 8-8 is VERY disappointing, they have been repreived because they are in the playoffs). The only reason the Jaguars are all the way down at #10 is because the season itself lacked any semblence of promise from about Week 3 on. The season, as a whole, is heart-wrenching for fans of a team that watched last year, as David Garrard came to life (just in time for an ill-advised contract extension) and the defense physically dominated opponents. But, in the grand scheme of things, these fans have had plenty of time to deal with the disappointment, which I believe is a bit easier to handle–the slow burn is not nearly as bad as the suddenness of some of the stomach punches that NFL fans around the country have experienced this year. The Dolphins are coming off a 1-15 season. The Patriots lost Tom Brady and missed the playoffs. The Jets never got it together with Favre and missed the playoffs. The Bills started 5-1, with three of the wins coming against teams that made the playoffs last year (Seattle at home, at Jacksonville, at San Diego). All four of those statements are completely true, yet somehow the Bills are not in the playoffs. To make matters worse for these long-suffering fans, the games they lost in their 2-8 finish were heart-wrenching losses in themselves. They blew a double-digit second half lead against Miami in Week 8; they lost on a 47-yard field goal that went wide right (sound familiar?) in Week 11; and, they fumbled away a sure win against the Jets in Week 15. And, just as if this collapse isn’t enough to devastate a fan base–they play in a division with intense rivalries and hatred, and they went 0-6 against division foes. It’s interesting that if the Jets had won one more game and made the playoffs, but the Packers did nothing different, Green Bay may have been #1 on this list, simpy because their 6-10 team would have to watch good ole Brett sling it around in the playoffs. But, the saving grace for the fans of a team that lost 7 more games this year than last is that they made the absolute right choice at quarterback. It’s a small consolation for a playoff favorite that lost 10 games this year, but it is a consolation. All things considered, it’s hard to complain if you’re a Patriots fan, especially after your team loses its franchise quarterback, puts in a guy who hadn’t started a game since high school, and they finish 11-5. But, just the sheer fact that they went 11-5 and have to watch the 8-8 Chargers host a playoff game has got to be incredibly frustrating for New Englanders. But, like I said, I have no sympathy. If they had gone 1-15, they probably would have been around #15 or #16 on this list, but they didn’t. They went 0-16. There is no future and certainly no present. This team is really bad and, unless massive changes are made, will remain so for a long time. What does it say, though, that I believe that there are four sets of fans around the league that would rather have invested their time and emotion in the 0-16 Detroit Lions this year than their own teams? FOUR!!! Hahaha. I don’t hate the Jets. I actually respect Jet fans (mostly just because they live in New York and choose not to root for the Giants). But, I do hate Brett Favre. And, I do find this season absolutely hysterical. And, hysterical in a way that cannot be good for the fans. They start out so hot. There is all this talk about a “Subway Super Bowl,” (which is ridiculous because both teams play in Jersey). And, then 20 interceptions later and this team has absolutely punished its already defeated fans yet again. And, to make matters worse, now they have to sit through an entire offseason of Favre Indecision 2009. The biggest 3-game collapse in the history of the NFL. No team has had a 3-game lead with three and not won the division. After Week 13, the Chargers were in second place at 4-8. How could the Broncos not win this division? I’ll tell you how–they lost three straight potential clinchers, including a home game against the Buffalo Bills. And, the Chargers won four straight–including a Week 15 miracle against the Chiefs, where they trailed by 13 late in the fourth, before scoring a TD, recovering the onside kick, and scoring another touchdown to win. Then, the next week, the Chargers flew 3,000 miles into Tampa Bay, against a Bucs team that needed the win and took that game too. Finally, San Diego put the final nail in the coffin of the Broncos (and their seemingly invincible coach–and Delta Sigma Phi brother–Mike Shanahan) themselves, with a 52-21 win in a winner-take-all game in Week 17. The only reason that this is not the most frustrating team to its fans this season is because, well, they are not really very good, so how upset can the fans be? Right? When the Bucs beat the New Orleans Saints one month ago yesterday, they were 9-3, in first place in the NFC South, and the talk was all about how unfair it is going to be if the Bucs make the Super Bowl and get to play in their home stadium. Their three losses were all on the road and all against teams that were expected to be among the leagues best (New Orleans, Dallas, and Denver). Their defense was being compared to the defense that won them the Super Bowl in 2002, and their offense had scored 110 points (27.5 average) in the last four games. The only question was whether or not they could hang on to a first-round bye. The fans were happy. Then the Bucs lost back-to-back road games against Carolina and Atlanta (in overtime), but still found themselves in good position, especially with the tiebreaker scenarios, and in GREAT position with the schedule. Going into Week 16, there had been eighteen games where a west coast team traveled to the eastern time zone. Only one of these teams had won. And, the Bucs finished with home games (in the eastern time zone) against the San Diego Chargers and the Oakland Raiders. Two wins would clinch at least a wild card spot, if not the division title. Well, it looked good against San Diego, as they had a 24-20 lead going into the 4th quarter. But, they gave up three unanswered touchdowns and lost 41-24. Still, though, it looked like they were catching all the breaks, as the Eagles lost to the Redskins (and eventually beat the Cowboys), meaning that, again, all Tampa had to do was beat a West Coast team, at home, and they would have been in the playoffs. And, this was a very bad West Coast team–the Oakland Raiders. The Bucs were two touchdown underdogs and were, again, leading late. They had a 24-14 lead late in the third quarter. Then, in the fourth, they were up 24-21, with ball on the Oakland 33 yard line. Their drive stalled and they turned it over on downs. The very next play, Michael Bush ran for a 67-yard touchdown to put the Raiders ahead. The very next play after that, Garcia threw an interception and the rest is history. The Bucs lost four in a row to close the season, including two at home, in games that they had no business losing (one to Coach Gruden’s old team, the Raiders). And, if that isn’t bad enough, their best running back, Cadillac Williams tore up his knee in the fourth quarter of the Raiders game, and their legendary defensive coordinator, Monte Kiffin, is leaving the team to join his son’s coaching staff at the University of Tennessee. The only silver lining in this whole story is that it happened to Tampa Bay and I hate them so much because of the 2002 NFC Championship Game. But, either way, I’m sure that all 17 Buc fans are completely miserable. –Dodgers call Adam Dunn: The interpretation by some appears to be that the Dodgers aren’t going to just wait around for Manny, and they’re considering Dunn as an alternative. I think that’s non-sense. The Dodgers are not dumb enough to consider Adam Dunn as an alternative to Manny Ramirez. This is just a ploy to get the attention of Manny and Scott Boras, and I still fully expect Manny to be back in Dodger blue next year. –Red Sox sign Brad Penny: This is the kind of move that shows why the Red Sox have been so successful this decade, and why they’re probably the best run team in baseball right now. Sure, they have the money to take a $5 million gamble on a pitcher with arm problems, and a player in Penny’s position is more likely to want to go to a winning team, but the Sox just picked up a guy who only two seasons ago had a Cy Young-caliber season, going 16-4 with a 3.03 ERA for the Dodgers. If AJ Burnett is worth $82 million, than I think $5 million for one year of Penny qualifies as a bargain. -In a related story, the Sox signing of Penny would seem to make it less likely that they end up with Derek Lowe. It seems like Lowe may be destined for Queens, but it looks like it’s still up in the air. –Nationals sign Daniel Cabrera: I like this signing. Another low-risk deal (1 year, $2.6 million) for a 27-year-old that has great stuff, and could end up being a good major league starter if he can figure out how to throw strikes. I’ll say this: the Nationals are much better off making signings like this, rather than handing $180 million to Mark Teixeira. Glorious. Ridiculous. Hilarious. Perfect. These are just some of the words that repeatedly came to mind as I watched the Eagles dismantle the Cowboys. Hilarious was probably the winner though. As Joselio Hanson sprinted down the sideline for a 96-yard fumble return to make it 41-3 in the 3rd Quarter, all I could do was cackle. Sunday was, without a doubt, the best regular season NFL day of my life. Thank you Oakland Raiders and Houston Texans, for not giving up and surmounting 10-point deficits (going into the 4th quarter in Oakland’s case) to win games that didn’t mean anything to you. Thank you Wade Phillips, for coaching the Cowboys, for taking one of the most talented teams in the league and not getting them to the playoffs, for being a players coach on a team that needs the exact opposite, and for your overall lack of competence. Thank you Tony Romo, for choking at every single opportunity in your career so far. The main highlights: dropping the snap in the playoff game against Seattle two years ago, losing at home as the #1 seed in the divisional round last year, and this game against the Eagles. It’s a trait I truly value in a Cowboy quarterback. 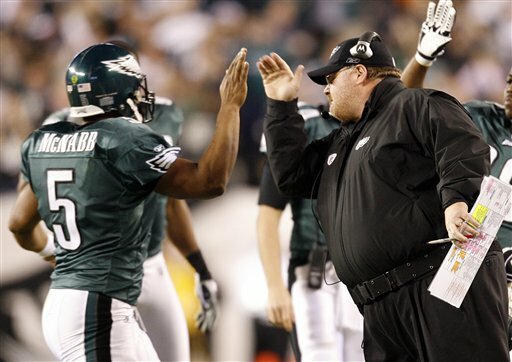 Thank you Andy Reid, for committing to the running game right from the start on Sunday, for showing some emotion on the sideline, and, most of all, for being the best coach in Eagle history. Thank you Brian Dawkins, for the two strips that led to touchdowns on Sunday, for the ‘Fly Eagles Fly’ dances after every touchdown, for being one of the best players to ever wear the Eagles uniform, and, whether or not this was your last game at the Linc, for going down as one of the most beloved athletes in Philly history. And finally, thank you’s go out to the Miami Dolphins and the Baltimore Ravens for their excellent seasons and wins on Sunday. Those wins kept the Patriots sitting at home this postseason, and that is a beautiful thing. I love that the Pats won 27 regular season games over the last two years and have just two playoff wins to show for it. It’s hard to explain what happened yesterday. We calculated a few weeks ago that the Eagles chances of making the playoffs at 9-6-1 were roughly 14%. Going into yesterday, it was probably no better than that. When the Bucs were up by 10 on Oakland, I got a Phillies championship DVD ready to go, for when the Eagle season was officially over. I never had to hit play, because suddenly we were looking at a virtual playoff game with Dallas. T.O., Jerry Jones, Tony Romo, Pac-man Jones, the ghosts of those Starred helmets, and every low-life Cowboys-fan-from-Philly that I’ve ever met over the last 15 years. It couldn’t set-up any more perfectly, to have these two teams meet on the last day of the season with a playoff berth on the line, and to have the Eagles absolutely decimate them. What a way to end an incredible sports year in Philly. Thanks Eagles, now let’s keep it going! I hate saying this, but the Big East is, without a doubt the best conference in college basketball this year. Yes, I know that they have 16 teams, so their standing in the nation is usually diluted if you examine further, but this year it is not diluted enough to take them out of the top spot. When more than half of the conference is better than West Virginia, it doesn’t matter how many “bottom-feeders” there are, this is an amazing conference. There are national powers and title contenders in UConn, Notre Dame, Pittsburgh, and Louisville. And, there are very solid teams that can beat anyone on any given day in Marquette, Villanova, Syracuse, and Georgetown. If Luke Haragody wins the Big East player of the year this year, he will be the 5th Big East player to ever win back-to-back Player of the Year honors, joining St. John’s Chris Mullin (who won at least a share of it 3 times), Georgetown’s Patrick Ewing (who shared it with Mullin twice), UConn’s Richard Hamilton, and most recently, Notre Dame’s Troy Murphy. When Patrick Ewing was inducted in the Hall of Fame this summer, he became the first Big East player ever elected into the Hall of Fame (which is AMAZING, considering all the greats that have played in this conference). The Big East does have five coaches that have been elected–Providence’s Dave Gavitt, Syracuse’s Jim Boeheim, St. John’s Lou Carnasecca, UConn’s Jim Calhoun, and Georgetown’s John Thompson Jr.
Bob Huggins finally returns to Cincinnati as a visiting coach this year. He did not go back last year because of the unbalanced schedule. I know the tried-and-true ACC readers will object, but honestly, it is not even close. The ACC is a distant second this year. They are a bit top-heavy, though that top is pretty good with UNC and Duke. Miami and Wake Forest should be solid tournament teams, and Clemson and Virginia Tech are also decent teams. No one is terrible–though UVa is close–so every night in the conference will be a test. Tyler Hansbrough, who already broke Phil Ford’s scoring record at UNC, only needs a season total of 602 points (he scored 882 last year) to pass J.J. Redick for the ACC’s all-time leading scorer. Before Redick’s accomplishment in 2006, the record stood for 51 years. The ACC has gone 20 consecutive NBA drafts with at least one first-round selection. 2008 was close, though, as NC State’s J.J. Hickson was the only ACC player taken in the first round (#19 to Cleveland). Virginia Tech ended an 11-year tournament drought in 2007, and Clemson ended a 10-year drought in 2008, leaving Florida State as the ACC team with the longest tournament drought. The Seminoles haven’t made the Big Dance since 1998. Duke came into the season with the nation’s longest active home winning streak against non-conference opponents, with 59 straight at Cameron. They have extended that to 65 so far this year, but have a test on January 7th against Davidson. The ACC won their 10th straight Big Ten/ACC challenge this year, though it was much closer than the other 9. Roy Williams is the active coach that owns the nation’s all-time best winning percentage. Mike Krzyzewski is the active coach that owns the nation’s most career wins. Gary Williams of Maryland and Oliver Purnell of Clemson are two of the seven active coaches who have 20-win seasons for at least 4 different programs. The ACC tournament is back to the enormous Georgia Dome this year. The only other time is was played there was in 2001, when they averaged more than 36,000 fans per session. I actually think that the “meat” of the conference is better in the Big XII than it is in the ACC, but the ACC gets the #2 spot for 2 reasons: (1) they do not have North Carolina and (2) the bottom of the Big XII is pretty bad. But, Oklahoma (who I believe to be the second-best team in the country), Texas, Kansas, and Baylor (probably the most underrated team in the country) may all find themselves still playing during the second weekend of the tournament. Plus, Oklahoma State, Texas A&M, Texas Tech, and Missouri are all decent teams. Though they finished 3rd in the overall conference RPI, the Big XII was probably the most successful conference last season. They had the most tournament victories (12) and the highest winning percentage of multi-bid conferences (.706). They also led the nation in non-conference victories over ranked opponents and 10 of the 12 teams finished above .500 for the season. There were more players from the Big XII (10) selected in the 2008 NBA draft than of any other conference. Kansas State’s Michael Beasley became the third straight Big XII player to be selected #2 overall, following a pair of Longhorns, Kevin Durant and LaMarcus Aldridge. Beasley became the first K-State player drafted since 1990 (Steve Henson, second round). The Big XII’s 6 Final Four teams since 2002 is more than any other conference. Kansas’s title last year was the first national championship for the Big XII conference. Kansas had won two prior championships, including 1988, but that was while they were a part of the Big 8. Baylor made its first NCAA tournament appearance since 1988 last year–and they return just about everyone of significance. Oklahoma State’s Marcus Dove (the lone loss for OSU) won his second straight Big XII defensive player of the year award last year, becoming only the second player to ever win a major Big XII award in consecutive seasons (KU’s Raef LaFrentz won back-to-back player of the year awards in 1997 and ’98). There had been 10 coaching changes in the past two season in the Big XII, but this offseason saw only one–Travis Ford taking over at Oklahoma State. This should show how thin the other major conferences are because I usually am very down on the Big Ten, but I could not find any reasons to put them behind the SEC, Pac-10 or Atlantic 10. Everyone knows that Purdue and Michigan State are national powers this year, but the biggest surprise has been Ohio State–led by freshman sensation, B.J. Mullens. Also, Wisconsin will always be good as long as Bo Ryan is employed there. Michigan, Illinois, and Minnesota have talent, and Penn State should be much improved. Though, Indiana and Northwestern are dreadful. The only new coach is taking over during the darkest days of the most storied program in the conference, as Tom Crean tried to right the ship at Indiana after the Kelvin Sampson flat-out mess. Two Big Ten freshmen, IU’s Eric Gordon and OSU’s Kosta Koufos, were picked in the first round of the NBA draft. B.J. Mullens will probably be the third straight Ohio State freshman center to be drafted in the first round in 2009, as Greg Oden went in ’07, and Koufos went last year. Purdue’s Robbie Hummel is the only 2008 first-team all-Big Ten player that is back for 2008-09. Last year marked one of the lowest points in the Big Ten conference, as they only placed 4 teams in the NCAA tournament and finished 6th in overall conference RPI. Though, the teams that did make the tournament–with the exception of Indiana, in peril–did well, as both Wisconsin and Michigan State made the Sweet 16, and Purdue won its first round game. Michigan State’s Sweet 16 appearance was their 6th in the last 10 years, which is tied with UCLA and Kansas for second during that time, behind only Duke’s 8. The Big Ten is the only conference to have 5 different programs reach the Final Four this decade (Wisconsin, Indiana, Illinois, Ohio State, and Michigan State 3 times). The ACC, Big East, and Big XII each have had 4. In 2006-07, Wisconsin set a school record with 30 victories. Last year, they broke that record with 31. Their 61-11 record over the last two years is the fifth best record in the nation over the last two seasons. Maybe I’m just down on the SEC right now, but I really think that the SEC West is pretty bad and the East is not good enough to compensate. Tennessee is great, again, and Florida should be greatly improved. Vanderbilt and Kentucky are talented, but the West is led by Ole Miss, LSU, and Mississippi State–all of which will probably not make the NCAA tournament. This is looking like a 4- or 5-bid conference–which is not good for the SEC. Remember Darrin Horn from the Western Kentucky Hilltoppers when they made the Sweet 16? Well, Horn is now coaching South Carolina. The other new coach is Trent Johnson, who left his fanastically successful job at Stanford to try and bring LSU back to national prominence. Both Auburn and Arkansas dismissed their best players from the team (the Tigers’ Josh Dollard and the Razorbacks’ Patrick Beverley) for undisclosed violations of team rules. Both Alabama and Tennessee were worried about losing their best players to the NBA draft (the Tide’s Ronald Steele and the Vols’ Tyler Smith), but both withdrew their names from the draft and decided to return to campus for this season. Kentucky has made 17 straight NCAA tournaments (though they were dangerously close to missing it last year), which is the longest streak in the SEC, the 3rd longest in the nation currently, and the 5th longest of all-time. Florida lost its 10-year streak of making the Dance last year, but they did go all the way to the semis of the NIT, before losing to UMass. In the last 6 seasons, all 12 SEC teams have made the tournament at least once. After probably the best year in the history of this great conference, the Pac-10 only has one true elite team this year–UCLA. The two Arizona schools are solid and should make the Dance, and the two Washington schools could be good, if things go right. Also, the other LA team, USC, has tournament-caliber talent and should be tough all year. But, the NoCal schools should struggle (though, we’ll see if the extreme talent in coaching can make up for a lack of talent on the floor), Oregon is pretty bad, and Oregon State is really bad. Last year saw all 10 Pac-10 coaches return, but this year shows 4 new coaches among the 10 teams–Johnny Dawkins at Stanford, Craig Robinson (the brother-in-law of our great president-elect) at Oregon State, Mike Montgomery at Cal (fantastic hire), and Russ Pennell as the interim coach at Arizona, replacing the legend Lute Olson. The Pac-10 set records with 7 first-round picks and 12 overall in the ’08 NBA draft. This also included picks #3, #4, and #5 (respectively, USC’s O.J. Mayo, and UCLA’s Russell Westbrook and Kevin Love). A record 9 of the 10 teams went to the postseason last year, including a record-tying 6 to the NCAA Tournament (tying the mark set in 2002 and, again, in 2007). The Pac-10 is 26-19 in the tournament over the last 3 years. Arizona extended the nation’s longest streak of year in the NCAA Tournament, as last year was their 24th consecutive appearance. However, their 20-year streak of consecutive 20-win seasons came to an end, as they finished 19-15. Sophomore James Harden, of Arizona State, is the only returning first-team all-conference player, and is also the top returning scorer in the conference. Washington State has led the conference in scoring defense for 5 consecutive years. Last yeat, they posted the lowest mark in the conference (56.4 ppg) since Oregon State in 1981-82. The 2007-08 Oregon State Beavers became the first team in the history of the conference to finish 0-18 in conference play. The conference that is too good to be called “mid-major,” but not good enough to be called “major,” checks in at #7 this year, solidly. In the late-90’s/early 00’s, the A-10 was good enough to challenge for a top 6 spot, and then in the mid-00’s, the A-10 was probably bad enough to be considered lower than conferences like the Missouri Valley or the Colonial, but last year and again this year, it is back solidly to its conference purgatory between Big Conference heaven and mid-major hell. Xavier is a very good team that should remain nationally-ranked for most the season. Temple, Rhode Island, St. Joe’s, and UMass should at least be in the discussion for at-large bids in March. LaSalle is much improved, and Charlotte and Dayton can rise up and beat anyone on any given night. The problem is that Fordham, Duquesne, and St. Bonaventure are pretty awful. Four A-10 teams will have at least 7 newcomers on their roster this year–St. Bonaventure (9, including 5 transfers), St. Louis (8), Xavier (7), and Duquesne (7, all freshmen). In fact, the Bonnies may have an opening-day starting lineup that includes no one that was on the team last season. Both Xavier and St. Louis landed talented 7’0″ recruits this season (Kenny Frase for XU and Brett Thompson for SLU). Derek Kellogg, who was the point guard on the UMass team that broke into national prominence, has taken over the head coaching duties at his alma mater. During Kellogg’s four years at UMass, under John Calipari, the teams went a combined 111-24. Probably the biggest obstacle to the A-10 in its quest to reach “major conference” notoreity is the fact that whenever a coach succeeds at an A-10 school, he is often wooed by more money and more prestige at a bigger program. Well, this offseason, four A-10 programs (including the two most important programs) locked up their coaches to long contract extensions to try and keep them in-house–Temple’s Fran Dunphy, Xavier’s Sean Miller, Charlotte’s Bobby Lutz, and Duquesne’s Rob Everhart. St. Joe’s is done in the tiny, little Fieldhouse, and is awaiting their new facility to be completed. Meanwhile, they will be playing their home games on the campus of University of Pennsylvania, in the most storied college basketball arena in the world–The Palestra. Has there ever been a regular season NBA game with more hype than the Christmas Day game in LA between the Lakers and Celtics? -I watched some of the fourth quarter of the Poinsettia Bowl last night, which TCU won in a tight one over Boise State. I don’t how long ESPN has been doing this, but they had something called “Interactive Tuesday” happening during the game. For anyone who hasn’t witnessed this abomination of sports television, “Interactive Tuesday” means that throughout the game, comments from random people on the internet are scrolled across the top of the game. This results in such amazing insights as “G-Dog2432: TCU rules!!! They should be in a BCS Conference!!!!!”. You know when you watch a Youtube clip, and then you start reading some of the comments below the clip? Then, after reading about four or five of them, you not only feel much dumber, but you feel angry that you just had a minute of your life stolen by the internet. “Interactive Tuesday” is like having those comments jammed down your throat, while you try to watch a sporting event. This is horrible and it must stop. I’ve often defended ESPN, but they’ve gone WAY over the line here. I just hope to God no one at Fox Sports gets wind of this…. -Speaking of ESPN, I’ll give you three guesses what they’re running a story about right now on Sportscenter on the day before Christmas. If you didn’t guess “Philly fans booed Santa Claus”, then apparently you haven’t watched sports or read about sports around Christmas any time over the last 40 years. Now, in ESPN’s defense, this story goes in-depth and explains WHY Santa Claus was booed (because he was drunk and falling all over the place). But that’s not the point. Even if Philly fans had booed a legitimate Santa, forty years ago, this story has been beaten to death and nobody cares. It’s absolutely lazy journalism at its worst. Anyone that even mentions it from now on is a terrible journalist and a terrible person. There I said it. -And on a slightly more upbeat note on this Christmas Eve, I watched some of the Kansas-Arizona hoops game last night. I’ve been hearing some buzz about Zona’s Jordan Hill being a potential lottery pick. I couldn’t understand it, because he definitely didn’t look THAT good last year. Last night was the first time I’ve seen him this year, and he looks like a completely different player. He’s added a mid-range jump shot to his game, and he just looks more athletic and explosive than he did last year. He has season averages of 19 points, 12 rebounds, and 2.7 blocks, which have to put him in the mix for an All-American spot. He clearly has the body of an NBA power forward and, as a junior, he’s starting to look like he has the game to go along with it. Has there been a more frustrating game–start to finish–for a team’s fans than the Eagles-Redskins game on Sunday? But, here is the kicker: if Dallas wins tonight AND both Tampa Bay and Atlanta lose tomorrow (not totally out of the question, as Atlanta is a road dog against Minnesota and Tampa has an injured qb at home against San Diego), then the Cowboys clinch a playoff spot, and therefore, will be much more likely to rest injured players like Romo and Barber against the Eagles, making that game MUCH easier. Here is my quick-fire recap of the action (much of it rumored) of last week in Las Vegas. And, you can trust me on these things because, well, I was there. Phillies sign Raul Ibanez. As Doogan touched upon, this signing is good, on paper, because of Ibanez’s production, the relative affordability of the contract, and his great work ethic and health for a 36-year old. He is also known to be a great clubhouse guy. But, the concern I have is the same one that Doogan so eloquently addressed–he’s left-handed. And, all the people who will spout that .305 average against LHs at you are failing to realize the key reason that we needed a righty. Ibanez in the middle of the order is not going to force a manager to change pitchers. Take, for example, a Manny Ramirez (I’m not saying that they should have signed him, this is just for argument’s sake). If you hit Utley 3rd, Manny 4th, and Howard 5th, you force managers to burn three pitchers any time those three come up in the late innings. Now, with Ibanez, you’re stuck either with Jayson Werth in between your two RBI guys or 3 straight lefties. Ironically, Ruben Amaro mentioned the three keys to the offseason: (1) get younger, (2) get more athletic, and (3) get a right-handed bat. Well, Ruben, you just spent $31.5 million and went 0-3. You can’t argue with character, though. Hey, at least Greg Dobbs is happy. Honestly, I’m not trying to be skeptical. I think this is a great acquisition. CC’s monster deal. As unsurprising as a record-setting $161 million contract can be, that is how this was. There was no doubt that CC would end up in the Bronx, the only question was how ridiculous would the contract be? And, you know what? It’s pretty ridiculous. He’s not Barry Zito, but he’s also not Johan Santana. And he is 295 pounds. I think the Yankees had to do this, but I bet they are regretting their steadfast committment to Ian Kennedy and Phil Hughes because the money would have been better spent on Santana. A.J.’s monster deal. Just as I was writing this, ESPN announced that the Yankees struck again, signing A.J. Burnett to a 5-year, $82 million deal. I do not think Sabathia’s deal is going to be a bad one, but I do think this just might. More on Burnett a little later. Indians sign Kerry Wood. The only surprise here is why did it take the Indians this long to realize that Joe Borowski isn’t a good closer. I think they would have been better served trading for Putz, Street, or Jenks, but with Wood, they don’t have to give up anything except money–$20.5 million. If healthy, he can be dominant. The Mark Teixeira Sweepstakes. The fact that Scott Boras holds all the cards should really be investigated. Tell me that he isn’t pushing Teixeira to the Red Sox because he can then sell Manny to the Angels or Yankees. And, tell me that he isn’t offering some team a discounted rate on Lowe or Tex if they will throw Jason Varitek an offer. Possibly the most interesting Boras client ever because his client has been outspoken about wanting to go to a winner, but the biggest offer is going to come from the worst team in baseball–and Boras clients NEVER pass up the highest offer. I am very much hoping that the Nationals make the best offer because I want to see what will happen. If he passes it up, Boras loses money, if he takes it, Boras loses face. I’m guessing he values money over everything, including face, but we shall see. The Jake Peavy Sweepstakes. Personally, I think Mark DeRosa would be a pretty good acquisition, which is what the Phillies would acquire in a three-way with the Cubs and Padres. And, it becomes a fantastic acquisition when you factor in that the pieces reported in the deal on the Phillies end are Chris Coste and either Kyle Kendrick or J.A. Happ. Yes…uh…please do that! Unfortunately, it looks like the Cubs are balking at the deal here that would acquire them a pitcher than, well, they probably don’t need. Anyway, here’s my question: if the majority of the “pitching” that San Diego is looking for is coming from the Phillies system, why can’t we cut out the Cubs, up the offer by adding Jason Donald (at least relatively comparable to Vitters, the Cubs’ farmhand in the deal) and maybe upgrade Happ to Carrasco or something and get Peavy to Philly? I know that he has said that he does not want to play in Philly, but didn’t he say the same about Chicago, if I’m not mistaken? And, don’t you think that he’s itching to get the hell out of San Diego, since they clearly don’t want him there? I hope that this thought has at least entered the conversation–why would the Cubs get Peavy if the Phillies are supplying most of the parts that the Padres want? Rafael Furcal Sweepstakes. Why are there Rafael Furcal sweepstakes? He was decent for the Braves. Then he was real good with the Dodgers, but could not stay healthy. I honestly do not understand how he is a “big-time” free agent, and this is coming from someone who blatantly overvalues shortstops, having been one himself. The Manny Ramirez Sweepstakes. Amazing what happens when the Red Sox cannot be involved. Manny Ramirez may be the best right-handed hitter of all-time, coming off the best 2 months of his career. How is it possible that there is no market for him? In the latest installment of the endless entertainment that Mr. Ramirez brings us on a perpetual basis, he is now saying that he might retire. Hahahahahaha. Braves acquire Javier Vazquez. This is one of those deals that slips right through the cracks–a lot of baseball fans may not have even realized this happened, but it’s kind of substantial, in my opinion. He’s certainly not a 1 or 2, but he pitches a lot of innings, which should really help an oft-beleaguered Braves bullpen. All those leftfielders. There are a ton of leftfielders on the market, which means that the “economic squeeze” is probably going to fall on the likes of Pat Burrell and company. Along with Burrell and Manny, there are also Rocco Baldelli, Juan Rivera, and tradeable commodities like Jermaine Dye and Delmon Young. The sleeping giants, the Angels, better wake up. So, the Angels, who have a lot of money to spend and have seen some pretty major postseason disappointment recently are involved in a lot of these free agents, but if the reports are true that they are falling behind on Teixeira, then what are they going to do? Turn their attention to Manny? I would, but who knows? How good can one rotation be? I totally believe in the belief that you can never have enough starting pitching, but why the Cubs are mortgaging some of their future for Peavy is kind of strange to me. Who is the fifth starter on that team, if they get Peavy? Ted Lilly? With Ryan Dempster as highly paid #4? Or does Dempster go back to close? I guess if you’ve gone 100 years without winning, you can’t take any chances, huh? Oh, the irony is hysterical. Did anyone else see that the Yankees and Brewers were very close to a deal that would swap centerfielders, with the older, more established Mike Cameron going to the Bronx and the younger, more questionable Melky Cabrera going to Milwaukee? Well, apparently, the deal originally fell through because–get this–the Yankees asked the Brewers to PICK UP SOME OF CAMERON’S SALARY! Now, this would be funny for the New York Yankees to ask any team to pick up some salary, but asking the Brewers on the day after the Yankees outbid them by more than $60 million on the one guy the Brewers franchise has ever really wanted to keep? Hahahahahahahahaha. How is A.J. Burnett any different than Ben Sheets? Now, I am probably very wrong about this, but please explain to me the difference between A.J. Burnett and Ben Sheets, other than them was hurt last September and the other had his only good month last September. Why is Burnett (very talented, history of arm trouble, no heart, no real sustained success on the ML level) able to command an $82 million deal when Sheets (very talented, history of arm trouble, minor character concerns, well-proven ML success when healthy) is getting no real suitors for anything more than a relatively inexpensive 2-year deal? Is there a much larger discrepancy in their injury histories than I can see? Doesn’t anyone else see the glaring holes that $243 million could have fixed, but did not? The Yankees payroll is through the roof. They committed $161 million to Sabathia and $82 to Burnett. Now, don’t get me wrong, these are two good pitchers, especially Sabathia, but let us not overlook a couple glaring weaknesses, one of which is MAJOR, in my opinion. First of all, other than A-Rod, they don’t really have much thump in that lineup. Second of all, everyone talks about the bullpen being so good–and it probably will be if Joba is a reliever. But, he is not going to be, so it’s average, at best. Finally–and this is the BIG one, if you ask me. Their up-the-middle defense is TERRIBLE. Derek Jeter was a very good shortstop, but he is most certainly NOT anymore. Robinson Cano is a below average secondbaseman. Melky Cabrera is a bad centerfielder (though they may trade for Cameron, who is good, but highly overrated), and Jorge Posada is a DH who wants to catch. That is TERRIBLE. Phils swap a AA catcher for a ML catcher. I like this deal because Paulino is, at least, a ML-caliber player right now, while we wait for Marson. And, Jaramillo was never going to contribute because of Marson. Phillies extend Charlie Manuel. He is under contract with the Phightins’ through the 2011 season now, which would make his the longest tenured Phillies manager since Paul Owens. Plus, every article that starts with “The World Champion Phillies” is fine by me. A baseball move, above all else. Well, the Rays people feel that trading Edwin Jackson for Matt Joyce is a great move. I am not so sure. Jackson is young, cheap, and won 14 games last year. That should command a high price. Yes, Joyce is a promising power-hitter, which is exactly what the Rays need and, yes, Tampa has an abundance of young, cheap, quality starting pitchers, so maybe it does make sense. The one thing that I love about this deal is that it is strictly a “baseball trade.” There were no salary issues, no locker room issues, no behind-the-scenes stuff. This was strictly one team needing a young pitcher and another needing a young hitter, so they traded. That is awesome. Orioles trade Hernandez to Reds for Freel. On the other side of the spectrum, the Orioles dumped salary because they have a prospect coming up. Ramon Hernandez and his $8.5 million contract was traded from Baltimore to Cincinnati, in exchange for hard-nosed outfielder Ryan Freel. The Orioles best prospect is a catcher, Matt Wieters, and he is ready to step up. The talent they received is probably not compensatory, but Ryan Freel is a good clubhouse guy who plays very hard–something from which this young team may benefit. Royals add 3 semi-valuable pieces. Not ever big “players” in the Hot Stove League, the Kansas City Royals have done a decent job this winter, in adding several bit pieces. They traded for Coco Crisp from the Red Sox and Mike Jacobs from the Marlins (though they gave up some young talent), and added Kyle Farnsworth in free agency. These aren’t earth-shattering moves, but f the last couple of years have taught us anything, it is that the small moves are what lead to World Series titles, not the big ones. Okay, I’m not saying that these additions will make the Royals World Series contenders, but it is the right direction. Struggling economy? Apparently not. Did you see what the Giants gave Edgar Renteria? How does Edgar Renteria sleep at night after signing that contract. In this year of the “struggling economy” and hard times for free agents, there are still stupid general managers who will give a mediocre shortstop with injury and character issues in the past a 2-year, $18.5 million contract. Why? Twins resign Nick Punto. This is only news because I really wanted the Phillies to bring back the little guy. He would have been a great fill-in for Utley for a couple months and then brought utility to the team the rest of the year. However, I’m glad for him that the Twins ponied up and gave him an $8.5 million, two-year deal. I probably wouldn’t have wanted him at that price. Tigers signed my favorite MLB player. This is only news because of my professional obsession with Adam Everett. The Tigers decided that defensive shortstops are still valuable–at least worth a million bucks–and that offense is completely overrated, as they agreed to a one-year deal with Adam Everett–the major league player who most has the major league equivalent of the the D-III game that Yours Truly brought to the table. Blue Jays take a shot on Matt Clement. Yes, Matt Clement hasn’t made a start in a year and a half, but why not take a chance? The guy was talented and with medicine these days, who knows? That’s exactly what the Blue Jays did when they signed him to a minor league contract. Oswalt’s offer is fantastic. Roy Oswalt said that he is willing to restructure his contract to help the Astros compete in the financial market of free agents and the Hot Stove League. Granted, he is not offering to take a pay cut, according to Richard Justice, but still he is doing anything he can to help his team win–even in the offseason. That’s the kind of guy I want on my team. Why would the Mariners not bring back Junior Griffey? I rarely advocate bad teams spending money on aging players; the Mariners are a very bad team and Junior Griffey is a very aged player, but this time it’s different. He has been such a great person to this league and bringing him home should easily pay for itself in seat revenue, if he is healthy at all. They are talking about it, but they should just go ahead and do it. Pat Burrell. The market for Burrell is pretty dry, apparently. He probably picked a really bad year to become a free agent, but then again, he’s already signed quite the contract in the past. Chan Ho Park. Apparently, the Phillies signed him today. Surprisingly, I don’t really mind this deal, even though it is for $2.5 million and a bad pitcher. I think Park has something left and it might be worth taking a shot (albeit, a relatively expensive one). I don’t think there is any way that he is worse than a decent 6th or 7th inning guy. Again, expensive for a middle reliever, but you’re paying for the upside. Andy Pettitte. With the Park signing, it looks unrealistic that the Phils bring in Pettitte. I don’t think they really had a shot anyway. Delmon Young. Why they would trade prospects for such a terrible human being is beyond me. Fortunately, the Ibanez signing pretty much put a fork in these talks–not that the Phils were all that serious to begin with. Juan Rivera. They chose Ibanez. Good choice, methinks. 1). With Matt Ryan leading the Falcons to their 9th win of the season, they tie the all-time NFL record for wins in a season by a team with a rookie quarterback and a rookie head coach. Interestingly enough, they tied the record held by…the 2008 Baltimore Ravens. Yes, before this season, the record for wins in a season by a team with rookies at quarterback and head coach was SEVEN. Both the Ravens and the Falcons have rookies at QB and head coach, and they are both 9-5. 2). With Kurt Warner’s resurgent season, he has set the franchise record for career 300+ yard passing games as a Cardinal. Now, the Cardinals haven’t exactly had a long, storied tradition of great passers (hell, the record he broke was held by Neil Lomax), but still, do you think Cardinal when you think Kurt Warner? Not at all. I thought this was weird…and ridiculous. 3). Kerry Collins has passed Jim Kelly for 14th all-time in passing yards. Read that again. If Collins comes back as a starter in the NFL next year and has an average year (2,500 yards), he will pass JOE MONTANA into 10th all-time.